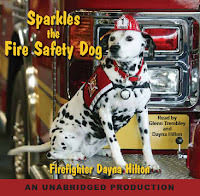 Firefighter Dayna, her dad, Firefighter Glenn, and son, Firefighter Michael are in the process of making Sparkles the Fire Safety Dog as an audio book! Wow! You will have so much fun spending time with me as I helps teach fire safety. Spending the day with me is so much fun!